Not only did Career Magnet hold a five-point lead over Fairfield Prep after three quarters Sunday, but it also had the Jesuits' two biggest weapons into foul trouble. But, staring at its greatest challenge of the season, the state's top-ranked team found a way to stay perfect. Fueled by a 17-6 run at the start of the fourth, Prep rallied past Career 63-58 in a matchup of unbeatens Sunday at the Floyd Little Athletic Center in New Haven. Point guard Keith Pettway scored 20 points and Thomas Nolan added 19 to move the Jesuits to 11-0. Career, the state's sixth-ranked team, dropped to 8-1. With Nolan saddled with four fouls and 7-foot center Paschal Chukwu with three, the Jesuits tweaked their halfcourt offense. Down 47-42 to open the fourth, they regained a two-point lead with a 9-2 spurt. "I think if we stayed doing what we were doing, we were going to lose," Prep coach Leo Redgate said. "We made a very good adjustment. "We moved Paschal to the free-throw line and we gave them a little 2-1-2 look." The adjustment allowed for more movement and enabled Pettway, one of the team's top ball-handlers, to attack. The senior went 8-for-8 from the free-throw line and accounted for 10 of the Jesuits' 21 points in the quarter. At the other end of the court, Pettway drew a key charge in the final minute. "Career was just playing aggressive defense, like any other team's going to play against us," Pettway said. "We just had to find the open guy, get off screens and go back door." Career knotted it 53-53 midway through the fourth, but Prep used a 6-0 spurt -- keyed by four free throws from Pettway -- to go ahead for good. "A couple plays here and there. That's it," Career coach Larry Kelley said. With star guard Ryan Murphy out with an ankle injury and Chukwu limited to 10 points, the Jesuits benefitted from their depth. Guard Dave Zielinski contributed 10 points. Chukwu fouled out with 1:04 left and his team up 61-56. "We don't run things through Paschal," Redgate said. "We don't have special plays for special players. We like to think, together, our team is very well-balanced. Other guys step up." Career got balanced scoring as well, with 20 points from forward Jordan Lomax and 11 from Justin Campbell. Seven different players scored for the Panthers. The Panthers trailed 14-9 after one quarter, but rallied to take a 29-28 lead at halftime behind their attacking guards. They led 38-33 in the third quarter before Nolan evened it with five straight points. 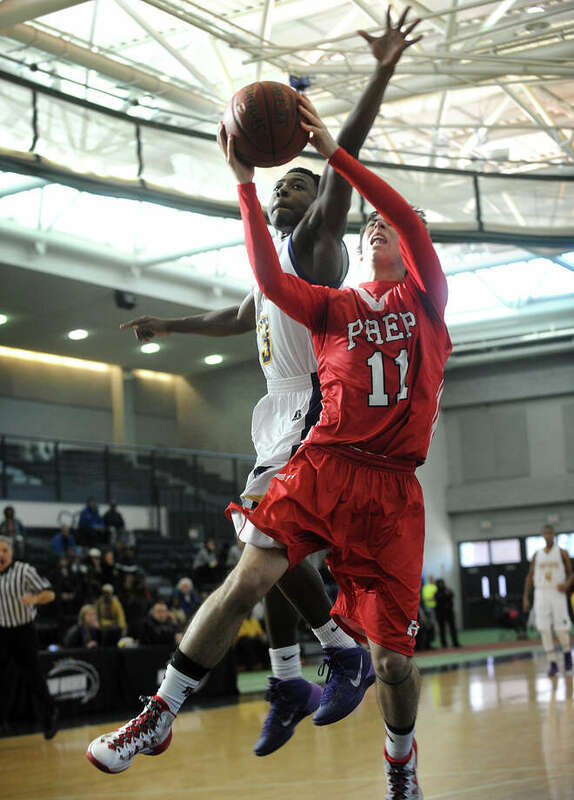 The up-tempo attack helped send Prep into foul trouble, but ultimately the Jesuits kept pace. "We're going to take a lot of teams out of their element with their quickness," Kelley said. "A lot of times, teams don't see how quick we are. These guys are quick, maybe not quick enough tonight." Keith Pettway 6 8-9 20 Thomas Nolan 5 8-10 19 Ray Featherston 0 0-0 0 Dave Zielinski 3 4-4 10 Ryan Foley 3 1-2 4 Joseph DiGennaro 0 0-0 0 Van de Berghe Richard 0 0-0 0 Paschal Chukwu 4 2-4 10. Totals 21 23-29 63. Amos Ford 2 0-0 4 Matt Hamilton 2 3-6 7 Jordan Lomax 4 10-11 20 Tyrell Eaddy 1 3-4 5 Tyreek Perkins 2 0-0 4 Justin Campbell 4 3-3 11 Justice Phifer 3 1-2 7 Aaron Eaddy 0 0-2 0 Ralph Bidon 0 0-0 0 Daniel Ampofo 0 0-0 0 Kayvon McCoy 0 0-0 0 Alden Singley 0 0-0 0 Ed Saunders 0 0-0 0 Kevin Smith 0 0-0 0 Earnest Harold 0 0-0 0 Justin Gordneer 0 0-0 0. Totals 18 20-26 58. Technical fouls: FP -- Chukwu, bench. CM --Larry Kelley.